I was recently sent two products by KKCenterHK for review purposes. The products sent were a 10g jar of 2.5mm Matte Blue Circle Glitter (item # NNAIL-HT030-2-5mm) and around fifty 3mm Holo Square Studs (item # NNAIL-DRN656). 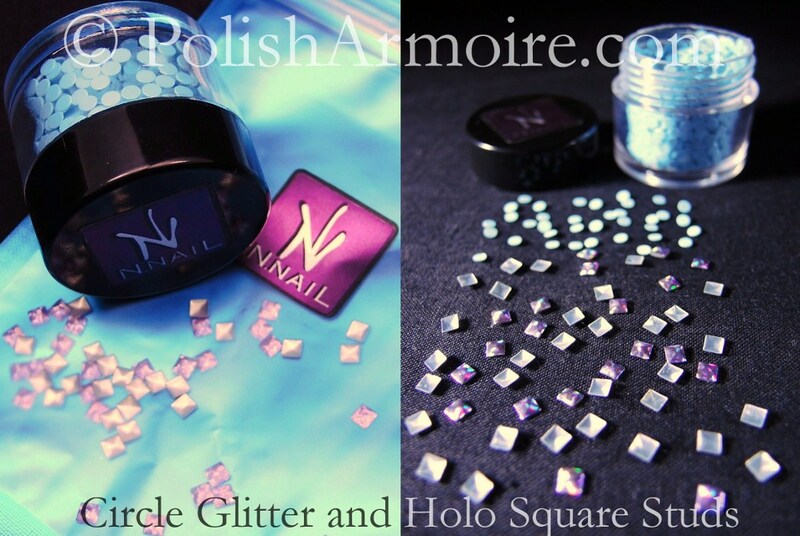 I’ve combined both products into a circle glitter and square stud nail art look. You can get 10% off any purchase at KKCenterHK using the code polisharmoire until the end of January, 2014! The studs were really easy to use and I cut some of them in half with scissors so that they fit nicely on the edges of my nail. It should be noted that you may need to bend the cut pieces around the barrel of a pencil or dotting tool so that they fit the curve of your nail after being cut. They’re very unique and pretty. The circle glitter was also easy to place though I haven’t tested whether it is also solvent resistent for polish making or frankening. The studs stayed on my nails for a good week before I changed my mani. The trick to longevity is to put a thick coat of topcoat over the top. I used two coats of OPI My Boyfriend Scales the Wall on my index and middle finger, one coat of Cult Nails Nevermore on my ring finger, and two coats of Cult Nails Tempest on my pinky. Tempest is brighter and more opaque than My Boyfriend Scales the Wall. You can achieve opacity with one coat of Tempest if you are careful with how you apply it.